I recently read my first Steven Herrick book- Pookie Aleera is not my boyfriend, which is about a year 6 class, and may be more suited to your school needs. It was fantastic. I was rather blown away. I’ve got The Simple Gift sitting in the house waiting to be read, possibly this week as I’ve got a bit of time off. I do know that it’s used as a HSC text in NSW. Ah, I didn’t know it was an HSC text, that makes sense! I think it would be brilliant in the hands of a good teacher – I wonder what they pair it with, and what themes they are exploring. (There’s quite a few in the book). Pookie Aleera has won heaps of awards, it’s in my pile of books for processing at school. (Yes, LOL I have a mountain of TBR books there too, I try to read one each week so that I can match the right book with the right kid and I think I’ve read all the picture books now, but I’ve got a long way to go before I’ve read the whole fiction collection). Like Louise, my first Herrick was Pookie. It’s wonderful and I now give it to every Yr 6 child I know! I believe the main theme is belonging for The Simple Gift, but as of 2015, the HSC texts change – the theme becomes discovery. My eldest stepson will be in that group, so Mr Books & I plan to read his texts too. His teachers seem very excited about a change (after 5-6 yrs) in texts, theme and lesson plans! LOL There’s always controversy when the new lists come out, I wonder what the fuss will be over in 2015? 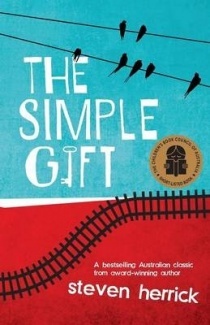 However, FWIW, I think The Simple Gift is a terrific book, but, it only takes an hour to read and there’s not much complexity to it . Of course with 90% of students doing Year 12, lists have to include books for all abilities, but I do hope that at HSC level there are other, much more demanding texts as well … I was a very well-read young student, but the books I read for HSC such as Language and the Pursuit of Truth, Authority and the Individual, The Power and the Glory, The Go-Between etc introduced me to a style of writing and to ideas that were new to me, and that’s what I think HSC should do.